An analysis of dog bite fatalities over a 13-year period identifies the breeds of dogs involved, victim age groups, number of dogs involved, household factors, criminal charges and more. Chart depicts dog breeds that killed ≥13 people during the 13-year period. 33 dog breeds contributed to ≤9 deaths and are excluded from this chart. 9.5% of all fatal attacks involved multiple breeds, thus the total number of deaths attributed to each breed will always exceed the actual number of deaths. This report examines the breeds of dogs involved in fatal attacks on humans, age groups and genders of the victims, the number of dogs involved, family and dog relationships, property statistics, household and time factors, criminal prosecutions following lethal dog attacks and states with the most occurrences. This report also examines the changing metrics in U.S. fatal dog attacks since the CDC last examined this issue (1979 to 1998). A group of dog breeds followed rottweilers, each with fewer than half the number of deaths: German shepherds 20 deaths, mixed-breeds 17 deaths, American bulldogs 15 deaths, mastiff/bullmastiff combination 14 deaths and huskies 13 deaths. The 13-year data set shows the combination of pit bulls, rottweilers and "baiting" bull breeds, fighting and guardian breeds -- American bulldogs, mastiffs, bullmastiffs, presa canarios, and cane corsos -- contributed to over 80% of all dog bite fatalities. 13-Year Dog Bite Fatality Chart by Breed: Chart depicts the top 7 killing dog breeds, inflicting ≥13 deaths during the period. Also in this report, 6 dog breeds contributed from 9 to 4 deaths, 7 breeds contributed from 3 to 2 deaths, and 20 breeds contributed to 1 death. Of all age groups, children ages 0-2 had the most victims, 27% (115). The highest age-specific fatality rate is infants <1, which comprised 48% (55) of this group. The 50-69 and ≥70 age groups followed, each accounting for 18% (76) of all deaths. Over the 13-year period, male victims (223) outnumbered female victims (210). Among children ≤9 years old, male victims dominated 63% (132 of 208) to 37% and among adults ≥50 years old, female victims dominated 61% (93 of 152) to 39%. 53% (231) of attacks resulting in death involved 1 dog; 24% (105) involved 2 dogs; 8% (34) involved 3 dogs and 15% (63) involved a pack of 4 or more dogs. 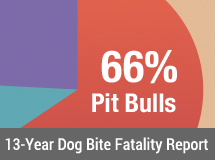 Of the 97 fatal attacks involving 3 or more dogs, 69% (67) included 2 or more pit bulls. In the 13-year data set, 25% (107) of fatal attacks occurred off the dog owner's property, close to the CDC study period of 24%.6 Pit bulls contributed to 68% (73) of these attacks and 76% (81) of all off-property attacks involved 2 or more dogs. Of the 82 fatal attacks involving unaltered dogs, male dogs carried out 52% (43), female dogs carried out 7% (6) and, 40% (33) of these lethal attacks included both sexes. Pit bulls inflicted 72% (31 of 43) of deaths involving only unaltered male dogs. From 2005 to 2017, family dogs inflicted 54% (232) of all fatal attacks. 64% (149) were perpetrated by pit bulls, up from an earlier period of 56% (2005 to 2010). Of the 284 fatal pit bull attacks, 52% (149) involved killing a family or household member. 19% (82) of attacks resulting in death involved a dog or person new to a household (0-2 month period). Children <2 years old accounted for 55% (45) of these deaths. Family dogs carried out 87% (39) of the deadly attacks in the <2 years old subset. 16% (68) of all dog bite fatalities involved a babysitter, grandparent or relative watching a child, or the dog being "watched" by a person other than its owner when the canine inflicted a deadly attack. Pit bulls carried out 74% (50) of these attacks. 27% (116) of all dog bite fatality victims were either visiting or living temporarily with the dog's owner when the fatal attack occurred. Pit bulls inflicted 73% (85) of these deaths. Children ≤9 years old comprised 66% (76) of these fatality victims. In the 13-year data set, only 21% (89) of all fatal dog maulings resulted in criminal charges. Pit bulls were implicated in 75% (67) of these criminal cases vs. attacks not involving pit bulls 25% (22) and at a rate 2.5 times higher than rottweilers. Over half of all deaths (47) resulting in criminal charges occurred off the owner's property. Of this subset, 87% (41) involved 2 or more dogs attacking; 66% (31) involved 2 or more pit bulls attacking; and 36% (17) involved ≥4 dogs attacking. Seven states followed with ≤29 deaths: Florida (29), Georgia (23), North Carolina, (21) Michigan (19), Ohio (19), South Carolina (16), Illinois (16). No fatal attacks were recorded in: Idaho, Nebraska, New Hampshire, North Dakota, Utah, and Vermont. Illustrates the breeds of dogs involved in fatal attacks on humans over the last 13-year period. 20 different dog breeds each inflicted 1 death (0.2%) and are excluded from this table. † Bullmastiff 6, English mastiff 2, Italian mastiff 1, mastiff (unspecified) 4, Neapolitan mastiff 1. 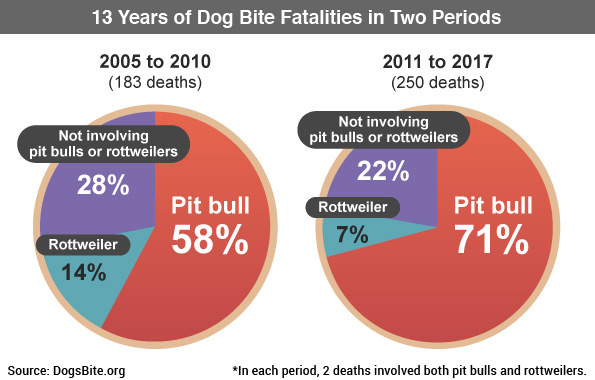 A chart that breaks down the 13-year data set into two periods (6- and 7-years respectively) shows the rise of pit bull fatalities between the two periods and the fall of rottweiler-inflicted deaths. Illustrates the percentage of dog bite fatality victims ages ≥10 years old has increased by 87% since the 1980s, and the percentage of fatality victims ages 0-9 years old has significantly fallen. Illustrates that pit bulls are a contributing factor to the rise of adult deaths, inflicting 72% of the attacks that killed a person ≥10 years old vs. all other dog breeds combined, which killed 28%. Illustrates that deaths inflicted by a single dog have substantially decreased since the first CDC study and attacks inflicted by 2 or more dogs (multi-dog household) have increased by 60%. Illustrates the top 9 states in total fatal dog attacks, the percentage of pit bull-inflicted deaths per state and the number of criminal charges filed, most commonly felony, after a fatal dog mauling. † Indicates below the national average of 21%. | ‡ Indicates unacceptably poor state laws in this area. If fatal attacks involving pit bulls were removed from the 13-year data set, 149 deaths would remain -- 11.5 deaths per year. That is a lower annual death rate than the CDC study years, 1979 to 1998, which averaged 16.5 dog bite fatalities per year. The 20-year CDC study period did include pit bulls, but the breed's population was only estimated to be ≤1% to 1.5% of the total dog population, compared to ≤6.5% today. If fatal attacks involving pit bulls were removed from the CDC study (76 of 331 deaths), 255 deaths would remain -- 13 deaths annually. Between the two study periods, one just before the 21st century and one just after, the total population of dogs has risen from 53 to 70+ million (1997 and 2012 AVMA U.S. pet ownership surveys) and the human population has risen from 272.6 to 325.7 million (1997 and 2017 U.S. Census Bureau). Despite the growth in both populations since the CDC study period, the extremely small number of annual deaths after excluding pit bulls from both periods (11.5 vs. 13 deaths per year) is virtually unchanged. "Rescued" pit bulls now outnumber pit puppies, by Merritt Clifton, Animals 24-7, June 14, 2017 (animals24-7.org). The chart, "Most popular U.S. dog breed categories & others of concern, 1900-1950 & since 2010," shows the last 3-year average of the total pit bull population is 6.5% (6.6% in 2015, 4.9% in 2016 and 8.0% in 2017). The chart also shows the 3-year average from 2010 to 2012 was 4%. Dog Bite-Related Fatalities from 1979 through 1988, by Sacks JJ, Sattin RW and Bonzo SE, JAMA, 1989;262:1489-1492. In comparison with the other top-six killing dog breeds, only 15% (3 of 20) of German shepherd victims were infants ≤11 months old, 13% (6 of 45) of rottweiler victims, 10% (28 of 284) of pit bull victims, 7% (1 of 15) of American bulldog victims, 0% of mixed-breed victims, and 0% of mastiff/bullmastiff victims were infants. Breeds of Dogs Involved in Fatal Human Attacks in the United States Between 1979 and 1998, by Sacks JJ, Sinclair L, Gilchrist J, Golab GC and Lockwood R, J Am Vet Med Assoc, 2000 Sep 15;217(6):836-40. Other sterilized dogs that fatally attacked a person included the following breeds: American bulldog, doberman pinscher, mastiff, German shepherd-mix, and rottweiler (female and male in separate attacks). DogsBite.org maintains an archival record of fatal wolf hybrid attacks (1980 to present). Similar to how we maintain an archival record for fatal pit bull attacks and fatal rottweiler attacks. Owners killed by their pet pit bull(s) by age group: 0-9 age group, 1 death; 10-29 age group, 5 deaths; 30-49 age group, 13 deaths; 50-69 age group, 12 deaths and ≥70 age group, 3 deaths. The majority of fatal attacks inflicted upon a primary owner involved a single dog 63% (34) and 37% (20) involved 2-9 dogs in a multi-dog household. 4 deaths in the multi-dog subset involved 1 or more rescue or rehomed dogs killing its owner; all 4 cases involved rescue or rehomed pit bulls. Overall, rescue and rehomed dogs accounted for 17% (9 of 54) of all cases where 1 or more family dogs attacked and killed its primary caretaker. 2005 - Tyler's Law, a Fresno County law named in honor of 6-year old Tyler Babcock, who was mauled to death by two pit bulls in Clovis, California. 2005 - Senate Bill 861, a state law enacted after the pit bull mauling death of 12-year old Nicholas Faibish. The law partially repealed California's preemption law that prohibited cities from enacting breed-specific laws, allowing San Francisco to adopt the first mandatory pit bull spay/neuter ordinance in the country. 2006 - Dorothy Sullivan Memorial Bill, a state law named in honor of Dorothy Sullivan, who was mauled to death by three pit bulls in Spotsylvania County, Virginia. 2007 - Dianna Acklen Act, a state law named in honor of Dianna Acklen, who was mauled to death by three loose dogs in Decherd, Tennessee. The act abolished the state's "one bite" rule and established strict liability under certain circumstances. 2008 - Lillian's Law, a state law named in honor of Lillian Styles, who was mauled to death by a pack of pit bull-rottweiler mixes in Thorndale, Texas. 2009 - Luna McDaniel Act, a state law named in honor of Luna McDaniel, who was mauled to death by three pit bulls in Ville Platte. The law was joined in the memory of 4-year old Michael Landry who was killed by three boxers in Morganza, Louisiana. 2010 - Hinds County enacted pit bull regulations ("Wild Animal Variance") after the mauling death of 5-year old Anastasia Bingham in Terry, Mississippi. 2018 - Senate Bill 571, a state law enacted after a rehomed pit bull with a bite history killed Margaret Colvin just hours after being adopted out in Virginia Beach, Virginia. 2018 - Emily's Law, a state law named in honor of 24-year old Emily Colvin, who was killed by her neighbor's five pit bulls in December 2017 in Section, Alabama. The Langley report only contains CDC Wonder database data: state, age group, race, gender, population, year and underlying cause of death). Human Fatalities Resulting From Dog Attacks in the United States, 1979–2005 by Ricky L. Langley, Wilderness & Environmental Medicine, April, 2009, ;20(1):19-25.